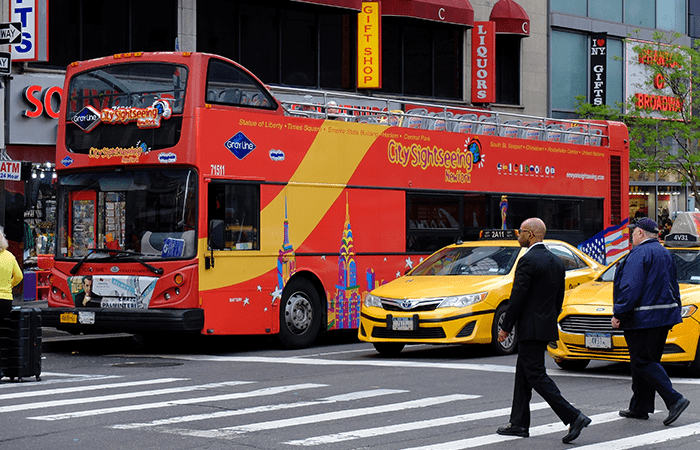 Take the CitySightseeing Hop on Hop off bus in New York for a fun and convenient way of sightseeing during your stay. The buses drive along all famous spots in Manhattan and Brooklyn. You can hop on or hop off at multiple stops. Please note that tickets for these buses are only available in combination with tickets for other attractions. 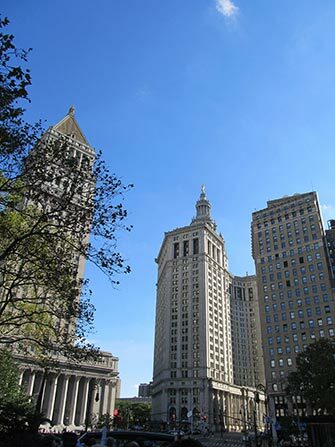 Take the Downtown loop to discover all main attractions in Midtown and Lower Manhattan. This loop starts at Times Square and goes past the Empire State Building, Battery Park and through SoHo, Little Italy and Chinatown. As you may have guessed, the Uptown loop goes through the northern part of Manhattan. The loop also starts at Times Square and then goes all around Central Park. If you stay on the bus, you’ll be back at Times Square in about 2 hours. 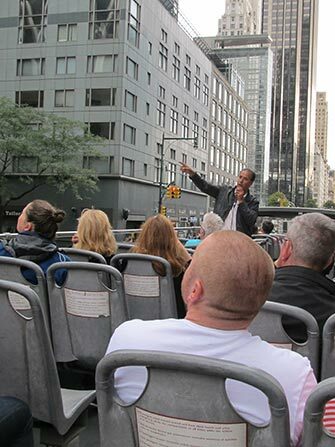 During the ride, the bus drives along the American Museum of Natural History, the Apollo Theater in Harlem, the Guggenheim Museum and the Central Park Zoo. 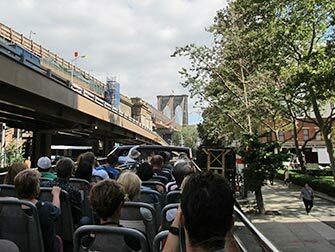 The Brooklyn loop is an extensive tour through Brooklyn including 8 stops in Brooklyn. You can take subway lines A or C to High St or F to York St and from there walk to Old Fulton Street by Prospect Street, which is the departure point of this loop. The Brooklyn loop passes several highlights in Brooklyn and during the ride, you can get off at different stops such as Barclays Center, the Brooklyn Botanic Garden and the Brooklyn Public Library. The CitySightseeing buses also offer a night tour. Please note that all tickets include one night tour. I’d definitely recommend going on this tour to see the most beautifully lit places of the city and the Manhattan skyline seen from Brooklyn. This isn’t a real Hop on Hop off loop as it doesn’t include stops, it’s more of a sightseeing tour. Make use of all Hop on Hop off loops for 48 hours and take the Hop on Hop off ferry to see part of Manhattan during one of these two days. The ferry stops between 10:00 and 15:00 at the World Financial District, Pier 11 and DUMBO. For many people who visit New York, shopping is an important part of their trip. Combine shopping and lots of sightseeing for a perfect stay! 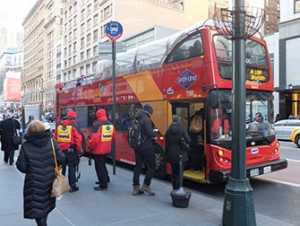 This package allows you to make use of the buses for 96 hours and includes one day at Woodbury Common Premium Outlet Center, tickets for Top of the Rock and a day on the Hop on Hop off ferry. You can redeem your paper or mobile voucher for this package at the Gray Line Visitor Center near Times Square. 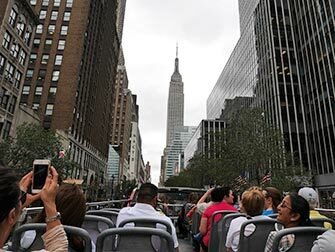 This interesting package includes 72-hour tickets for unlimited use of all Hop on Hop off loops, tickets for the ferry to the Statue of Liberty and access to Top of the Rock OR the Empire State Building. Booking this package is cheaper than buying separate tickets! After booking your tickets, you will receive a voucher through email with more detailed information. You don’t have to exchange the voucher before boarding the bus. You can scan your paper or mobile voucher at any stop along the route and hop on.